1. At the beginning of the film, there is a montage of death at the research facility. What song is the scene set to? 2. How did the plague - by way of Campion - escape the research facility? 4. Stu's friend is very concerned about the quarantined. He is convinced it is what illness? 5. The plague first takes hold in what US city? 6. Throughout the entire film, Larry's number one hit song is played and/or sang. The name of the track is: "Baby, Can You ___ Your Man." 7. What affliction does Nick have? 8. Mother Abigail says, "I'm 106 years old and I still _____." 10. 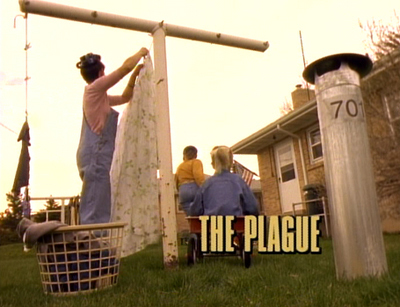 What commercial and product is played over and over throughout Part 1: The Plague? 11. The plague is called many names in the U.S. In this state, they call it "Captain Tripps." 12. What famous real-life basketball player has a cameo in Part , walking around New York City, ringing a bell and yelling, "Bring out your dead!!" 13. Larry bumps into a scary man in New York, who will later become a major bad guy. What is the nickname of this unsavory character? 14. Randall Flagg appears as what creature? 15. Stu is perfectly healthy, showing no signs of the plague. His captors prove this with _____ the guinea pig. 16. The first time Randall Flagg appears to someone as a man, he is seen where? 17. Nick gets promoted to what important position, due to the incumbent's sickness? 19. General Starkey is found dead from a gunshot wound with a sign around his neck. What does the sign say? 20. Larry's moms dying words of him are words of warning. She tells him to beware of who?